For this experiment, you will need to give each group of students 3 ice cubes that are uniform in size. Provide students with a number of extra materials with which to work…a lamp, outdoor sun access, warm water, etc. so that different methods to melt their ice cubes can be tried. Students are then asked to find the quickest way to melt their ice cubes. 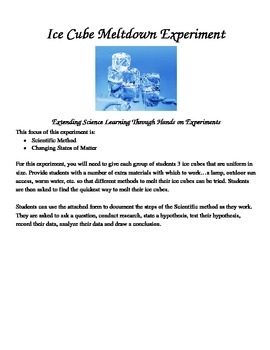 Students can use the attached form to document the steps of the Scientific method as they work. They are asked to ask a question, conduct research, state a hypothesis, test their hypothesis, record their data, analyze their data and draw a conclusion. This is hands-on experiment to help students see the Scientific Method in practice as well as working with changing states of matter! This could be used with a whole class, special education, 1st, 2nd, 3rd, 4th, 5th, 6th or even with a small group. We have tied this lesson into our unit on the Scientific Method and matter. Students have done a "close reading" (hello New York State and Common Core ELA!) of science articles related to this topic and are now practicing the hands on portion of their learning!